As Twitch, the internet’s foremost home for video game livestreams, continues to grow and evolve, at least one observable law of nature has emerged from its vast, raging sea of content: If you have a good idea, then other people will copy it and do it bigger and crazier until it reaches its most absurd extreme. It happened with Twitch Plays Pokémon, which was immediately turned into several other hopeless but intriguing endeavors following the same “tons of people simultaneously scream commands at a video game” format. 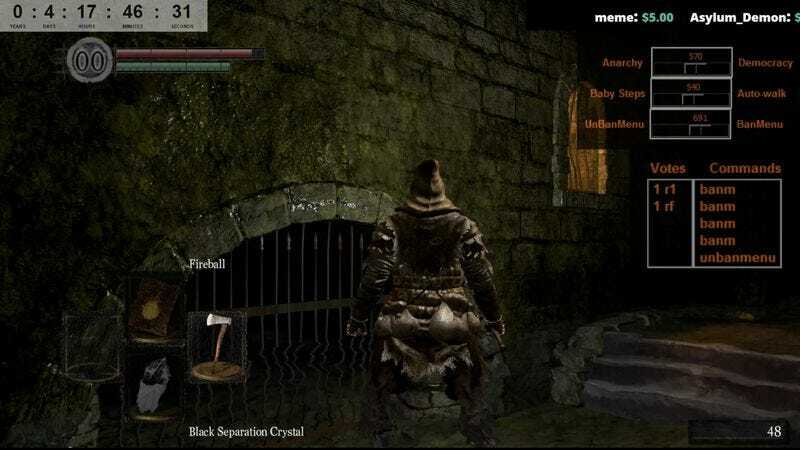 And it happened with Dark Souls challenge runs, where players try to finish that notoriously taxing adventure with increasingly unthinkable limitations—without levelling up, with the game displayed upside-down, with voice commands. In that time, the players have managed to create two characters, find and equip their starting weapon, unequip their starting weapon, climb a ladder, get the healing potions, and deliver a single punch to the tutorial area’s boss monster. Mostly, though, those 117 hours have been spent somersaulting into walls and splashing around in a puddle. Twitch Plays Pokémon didn’t fare much better in its early stages, but that was at least a simple turn-based 2D game that could conceivably be played with basic text commands. This just seems like an exercise in loosely organized madness. But the internet always finds a way. Godspeed, Twaddles.